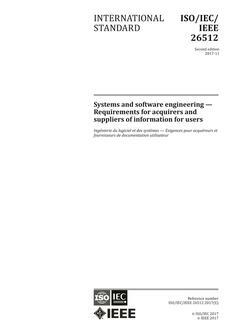 This document supports the interest of software users in receiving consistent, complete, accurate, and usable documentation and specifies processes for use in testing and reviewing of user documentation (Clause 6). It is not limited to the test and review stage of the lifecycle, but includes activities throughout the information management and documentation management process. This document is intended for use in all types of organizations, whether or not a dedicated documentation department is present. In all cases, it can be used as a basis for local standards and procedures. Readers are assumed to have experience or general knowledge of testing or reviewing processes. This document deals with the evaluation of end-user content only, and not with the evaluation of the software it supports. Revision Standard - Active. This document supports the need for software users to receive consistent, complete, accurate, and usable documentation. This document was developed to assist those who review, assess, and test software user documentation as part of the software lifecycle process. It is not limited to the review and test phase of the software lifecycle, but includes activities throughout the information management and documentation management processes. This document applies to printed and electronic documentation such as user manuals, online help, instructions, user assistance, tutorials, websites, and user reference documentation. Much of its guidance is applicable to user documentation for systems as well as the software used to control machinery or hardware devices. It applies to both initial development and subsequent releases of the software and user documentation. This document is intended for use by all types of organizations, whether or not a dedicated documentation department is present. Readers are assumed to have experience with or general knowledge of reviewing and testing processes.